Hard drive manufacturer Seagate has teamed with Paramount Pictures to preload more than 38 hours of Paramount movies on select portable storage drives. 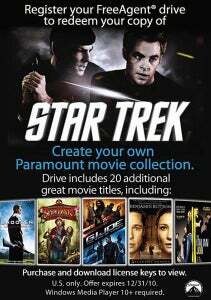 The offer, which is available immediately with specially marked 500GB FreeAgent Go hard drives, includes only one free movie--a copy of Star Trek directed by J.J. Abrams--but the other titles can be unlocked by paying $9.99 to $14.99 for each movie. In addition to last summer's sci-fi hit, Star Trek, your new Seagate drive will come with a grab bag of 20 additional movies. Potential preloaded content includes The Curious Case of Benjamin Button, Nacho Libre, GI Joe, The Hunt for Red October, Coach Carter, Jimmy Neutron: Boy Genius , and The Love Guru. To unlock the extra content, you will have to register your new storage drive online with Seagate. You will then be sent a license key to access Star Trek on your new drive, as well as the option to purchase and unlock further content. Once you've unlocked the content, you can view your movies using Windows Media Player on your desktop or laptop computer. You could also purchase the FreeAgent Theater+ HD Media Player--an extra set-top box--to view the movies on your television. However, it's likely you could also use Windows Media Center --a home entertainment application built-in to Windows Vista and Windows 7--to play your new movies instead of investing in yet another piece of set-top hardware. It's not clear whether the content's DRM protections would allow you to transfer these movies to portable devices like the Zune HD or Sony PSP . Innovative Concept or Premium Crapware? It's hard to know what to make of this offer from Seagate and Paramount. On the one hand, it sounds like the companies are making it easier for you to purchase and access legitimate copies of premium movie titles. Then again, this offer also reminds of me that much-hated Windows tradition known as crapware. For the uninitiated, crapware (also known as "trialware") is the numerous trial programs that come pre-installed on many new Windows computers, and can often slow down your new computer's performance right out of the box. Crapware is such a problem that programs like PC Decrapifier have been developed to help new users shovel all that useless garbage off their new computers. Dell has even advertised crapware-free devices as a selling point, and Sony tried, albeit unsuccessfully, to charge users a $50 fee for the privilege of buying new computers without crapware . So for Windows users, preloading devices of any kind with extra content or programs could be met with frustration or anger. Then again, this isn't your usual crapware offering anti-virus protection or music streaming capabilities, this is premium crapware that may prove popular with users. Let's face it, people like movies, and if your favorite movie happens to be loaded on your brand new hard drive, then why not go ahead and get it? Especially if it's only $9.99. Then again, how is preloaded, locked-down content all that different from getting crippled trial versions of programs on a new computer? Both can be annoying, and unless you plan on spending over $200 on new movies, you'll inevitably end up erasing a lot of this content anyway. It's a safe bet that the 20 plus movies you'll get on your new hard drive will occupy about 30 GB of storage space, since the average size of a two-hour movie file on iTunes is about 1.5 GB. That's hardly a significant portion of your new 500 GB hard drive, but didn't you buy that new portable hard drive to store all the crap you already own instead of purchasing more crap that manufacturers want you to buy? Prices for Seagate's preloaded drives start at $99, and the free Star Trek offer lasts until December 31, according to the Seagate Web site.